There is something special about watching your baby enjoy their first solid foods. Waiting to see their reaction to the new flavours and textures, interacting with them as they learn to chew and try to use a spoon… starting solids it is definitely a milestone to remember. All three of my babies have had different experiences with solids, and I have learned something new each time around. 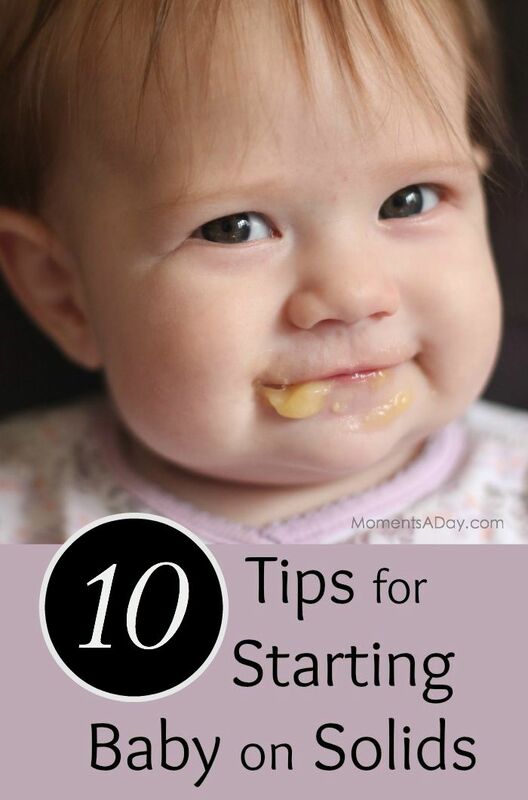 Here are my top 10 tips on feeding your baby solids for the first time. By the time baby is six months old, experts say parents should start thinking about introducing solids. Your baby will let you know when he or she is ready to start solids by showing signs such as interest in food, still appearing hungry after milk feeds, and being physically stronger (sitting up with support and having good head control). You can learn more specifics in this article. Don’t put pressure on yourself to start at a certain time. Each baby is on their own timeline, some are ready earlier and some are ready later. When I was a first time mother, I felt really stressed about knowing when exactly to start. The best news is that there is no “magic” time and you can go slowly as you introduce solids. There is no reason why you can’t let your baby try their first food and, if they don’t like it or are not as interested as you thought they might be, you can simply put it off for a bit longer. Learn how to make easy homemade baby foods. Mashed avocado or banana are great for starters. Cooked carrot, sweet potato, apple and pear are other good choices to begin with. When you first start offering solid foods, you can just offer one fruit or veggie at a time. Eventually you will combine them, and add other things like protein or rice. Have packaged wholesome baby food on hand. There are times when I haven’t been able to make baby’s food as planned (one of my other children is sick, or something else unexpected came up), so I like to have some packaged baby food ready to go whenever needed. Packaged food is also handy to take in your bag when you are going out to eat, to feed to baby in the case there is nothing suitable at the restaurant or your baby doesn’t like the food there. And, of course, it is a must-have for road trips or flying. If you are wondering which brand of baby food to buy, Heinz is great for quality and nutrition. From the sourcing of the ingredients, to how the food is cooked, to the recipes of each of the products, Heinz Infant foods are approved by nutritionists who are passionate about giving baby the tastes and textures appropriate for each stage. Starting solids can be messy! I try to sit back and let my baby enjoy her food, exploring it with her hands and a spoon, but I also always have a wet washcloth at the table to use when necessary. A splat mat (a plastic liner for the floor) is useful if your table is on carpet and, of course, bibs are great to keep baby’s clothes clean. Offer new flavours and textures. All babies are different. Some love to try new flavours and some rather stick to more bland tastes. Some gag at any lump in their food while others take to chewing like a pro. It is important to keep offering a range of new flavours and textures as your baby grows and reaches new stages, so he or she will be ready to eat bigger meals in the coming months when food makes up a larger part of the diet. Just offer the food with an open mind, and let your baby be the judge of if he or she likes it or not. Don’t compare your baby to other babies. As with any baby milestone, it is simply a waste of time to compare your baby to anyone else’s. Each of us has our own unique set of likes and dislikes, and food is a natural part of this. It can be helpful to chat with other mothers to figure out what baby food recipes their babies like or how much their babies are eating, but don’t worry if your baby is different… we all are! Often new mothers feel guilty if their babies do not take to eating with ease… perhaps their baby doesn’t usually want anything but milk, or refuses to eat the purees she spent hours preparing. It can be frustrating, but is likely just a phase. If your baby isn’t liking their food or you are worried about how much they are eating, set up an appointment with your doctor for ease of mind. Eating solids can be an exciting journey for both mother and baby! Each time I introduce new foods to my daughter, I remember what a simple pleasure eating is… and I try to relish the beauty that is seeing my baby experience one of many “firsts” during her precious – and fleeting – childhood. What tips do you have for new parents feeding their babies solids for the first time? This is a sponsored post brought to you by Heinz. All opinions are my own. To read more about reviews on my website, visit this page.